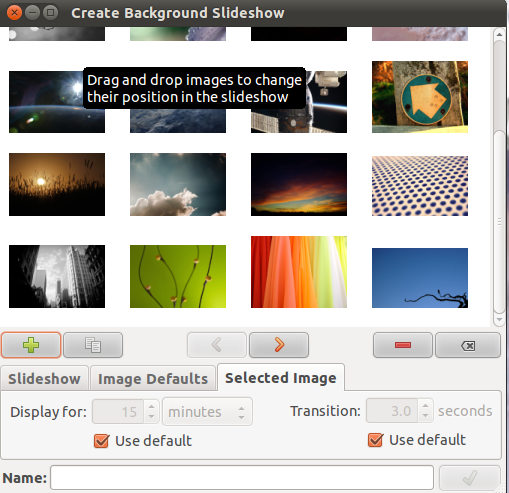 Create Background Slideshow (CreBS for short) is a Python/GTK application used to create and set desktop wallpaper slideshows for the GNOME desktop, and, by extension, the Linux distributions that use it, such as Fedora and Ubuntu. The image set defined is stored along with your ordinary wallpapers so it can be reselected in the future from the standard Appearance Preferences window. BTW: If you don’t want an application, you can manually create Windows7 style background slideshow in Ubuntu. In the window, click plus sign to add images. 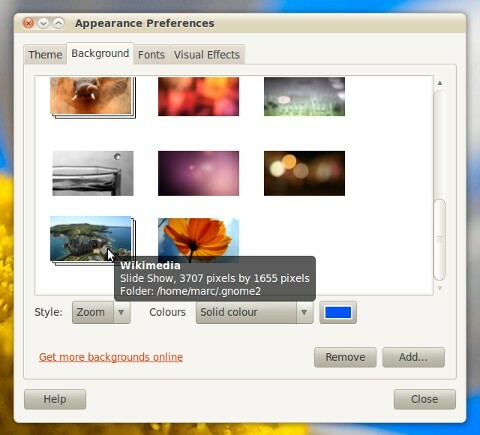 multiple images may be selected for addition within any particular directory, and you can even drag and drop images from your file browser or the Appearance Preferences wallpaper list. Then rearrange them into your chosen order using the Earlier and Later buttons or by dragging the image into place. If you change your mind about including an image, use the Remove button. Under Selected Image, override the default duration to set a favourite picture you want to see for longer than the rest. Under Image Defaults, set the default duration. Finally, give the slideshow a name and press Save to set the image sequence as your new desktop background. The set is added in with your other wallpapers, so you can use the standard Appearance Preferences window to change and restore the wallpaper in the future. 1 user responded in " CreBS – Create Background Slideshow (wallpaper changer) for Gnome Desktop "